Pachinko parlours (パチンコ屋) are everywhere in Japan and at weekends are invariably packed. Peek inside and you'll see rows upon rows of bright flashing machines - they look like a cross between a slot and a pinball machine - in a noisy, smoky, hypnotic amusement heaven. The game basically involves feeding small metal balls into the machine and watching them cascade down and bounce off pins, triggering payouts of more balls (see here for a guide to playing). There is some skill involved in controlling the feed speed, but the real skill is choosing the right machine: pros will line up early to get their desired machine. In this way, it is certainly possible to make a profit, but since gambling for cash is illegal in Japan, the balls one wins must first be exchanged for prizes (tokens) inside the parlour and these are then taken outside the parlour to a little "TUC" booth for cash. Pachinko is not the only exception to the "no gambling" rule in Japan. Horse, boat, and bicycle racing are immensely popular, especially amongst older men. You will often see such guys clutching specialist sports newspapers on the bus or train on the weekend as they make their way to the track or riverside. With one eye on tourism, especially Tokyo the 2020 Olympics, the government pushed through a law to legalise casinos in December 2016, ignoring widespread public fears of a rise in gambling addiction (gyanburu izonshō =依存症). This week, the government belatedly drew-up an addiction prevention law, a first in a country with more than 5 million suspected gambling addicts, a very high number given that gambling is in principle illegal. 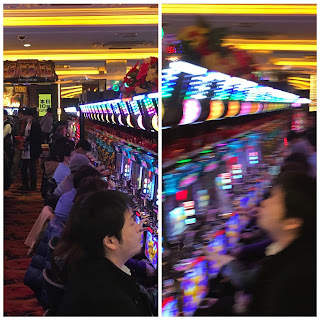 Watching the lines of (mostly) men lose themselves in the hypnotic smoke, noise, and lights that is pachinko on evenings and weekends, the bigger question is: what exactly are these people trying to escape from?